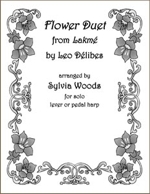 The Flower Duet is from the 1883 opera Lakme by Leo Delibes. Normally sung by 2 women, Sylvia has arranged this lovely song for solo harp. Although you may not be familiar with the title of his lyrical piece, you have probably heard it in commercials for companies such as Ghirardelli Chocolate and British Airways. The sheet music includes two 2-page versions, both in the key of A (3 sharps). They are basically the same, except that one is for lever harps tuned to C, and the other requires a B-flat. Fingerings are included, as well as lever and pedal changes. For intermediate players.